Pixels and Bytes A site for photography, technology, and anything in between. Last year, I had the rare opportunity to spend some time in Hong Kong. In my book, no other place on this planet seems to be designed for photographers. From the airport to the streets of Hong Kong and Kowloon, in the daytime and at night, the entire region is one big photo-op! Okay, perhaps I’m exaggerating a little bit, but for a shutterbug like me, I found that I didn’t have to go very far to find an interesting subject to shoot. 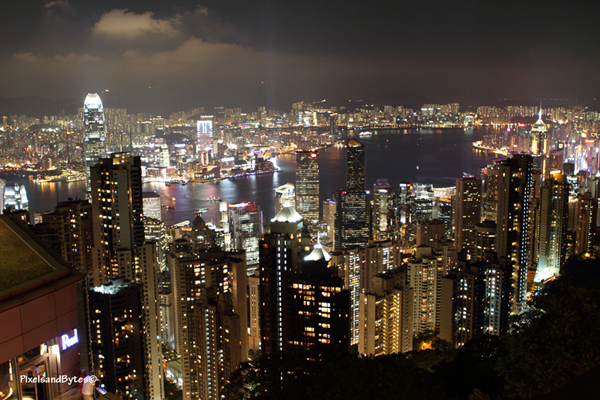 If you plan to visit Hong Kong, here’s a few tips from a photographer’s point of view. Tsim Sha Tsui: Apart from the shopping opportunities here, the famous Hong Kong Central skyline can be viewed across Victoria Harbour. On some nights, a light show plays from both sides of the harbour which gives very good photo opportunities. The Peak of Hong Kong: On the opposite side of Tsim Sha Tsui, The Peak of Hong Kong looks down on Central and across the harbour to Kowloon. The light show is not as grand when viewed from here but a different perspective is still welcome. Hong Kong Central: HK Central is a marvel of modern architecture. There are four buildings among others that stand out: The International Finance Center (IFC 1 and 2), the HSBC corporate headquarters, the Bank of China tower, and the Lippo Centre. Mong Kok: This area is packed with shops, markets and stalls that is a little out of the main tourist areas. An excellent place to experience Kowloon’s street life and to find a good bargain when shopping for, you guessed it, camera equipment! Po Lin Monastery: Home of the Tian Tin Buddha, the world’s tallest outdoor sitting Buddha. Views of the monastery and the surroundings adds to the serenity of this place. Aside from the photo-ops, Hong Kong is primarily known for shopping. Since I mentioned Tsim Sha Tsui (TST) and Mong Kok earlier, it is only reasonable to ask: “Where can I get a good bargain on camera equipment?” One thing I noticed is that bargains are harder to find, thanks to on-line shopping. Having said that, I would recommend shopping in Mong Kok, as opposed to TST. Before going in, do your research and find out how much you would have pay if you brought this equipment back home. In Mong Kok, you will come across reputable stores that will give you decent bargains, and others that are not so reputable who will give you prices too good to be true. The simplest explanation for the price difference is how the product is obtained. Grey market items cost less and is therefore cheaper, however, once you buy one, you’re on your own without warranty. With this in mind, there are franchise stores like Broadway and Fortress which you can get equipment slightly less than what you have to pay for at home. Personally, I recommend Wing Shing Photo Supplies, having dealt with them on a couple of occasions and the items I got came with their respective warranties at a decent bargain.